This Hot Beer Cheese Dip is quick and easy to make. It’s perfect for game day or anytime you need a cheesy snack. 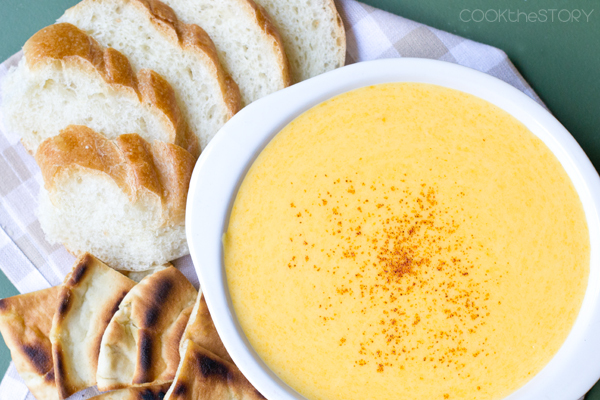 Serve it with crackers, baguette or broccoli and cauliflower florets for dipping. 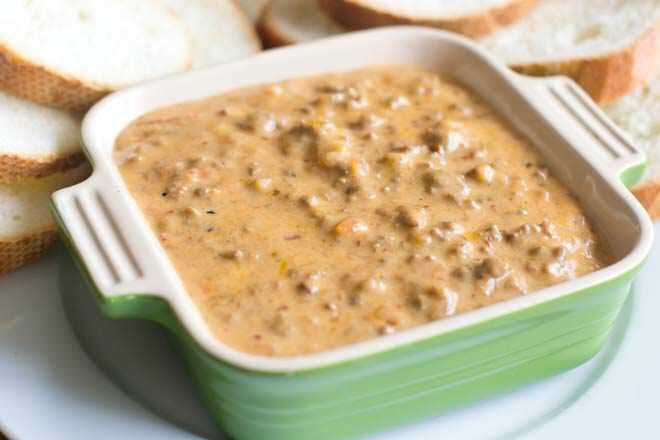 This Beer Cheese Dip is ooey and gooey, of course. But more importantly, it’s really quick to make and it uses ingredients that I always have at home. I like to serve it with slices of baguette but you can also use crackers or those long thin crispy breadsticks. It’s also a great way to get everyone to eat some extra veggies, especially broccoli and cauliflower since they go so well with cheddar cheese. So skip the bread and crackers and put some broccoli and cauliflower on the tray. You won’t believe how quickly it disappears. Stir in the beer, dijon, garlic powder, salt and cayenne. Return the pan to medium heat and stir until thick and bubbling, about 2-3 minutes. Remove from heat. Add the cheese one big handful at a time, whisking after each addition to melt it in. Taste and add more garlic, salt and cayenne if desired. Garnish with a pinch more of cayenne. *I originally posted this recipe in 2015. That version was tasty but over the years I’ve tweaked it. The tweaked version is what is now written above. But in case you camehere back in 2015 or 2016 and made this and loved it and want it exactly as it was then, I thought I should tell you what changes I have since made. The original recipe did not have any garlic powder in it, and it had only a pinch of cayenne. I think it is much better with the garlic and cayenne but if you like things a bit blander, go ahead and omit them. Video by Leigh Olson. Article, photos and recipe by Christine Pittman. This post originally appeared in January, 2015. It was revised and republished in January, 2019. Hi, if I made this as a gift and stored in an air tight container how long will it keep? Thanks. It really needs to be refrigerated. If it’s in an air tight container in the fridge, it keeps a week. OMG! The fried steak pieces in this dip have got to be insane. Thanks for a great idea! I made these last Saturday & it came out fantastic! Served it with pretzels one day & on burgers the next. I froze the leftovers to turn into beer cheese soup later. Thank you! You’re welcome, Gina! I’m delighted that you liked it and are finding so many uses for it. Great ideas! I just made this recipe and the overall flavor is great but the consistency is s bit grainy. Where did I go wrong? Kellie, Interesting. I’m not entirely sure. I have heard from people that using pre-shredded cheese can be a problem as it has a coating that prevents the shreds from caking in the packaging. However, I have used pre-shredded cheese and not had that problem. Lactose Free version- I made this recipe but used lactose free milk and Daiya brand cheddar cheese. It was excellent. I used it for soft baked pretzels and farmhouse tater tots. EXCELLENT!! Jennifer, This is wonderful to know. Thank you!!! I tried this last year for our Super Bowl party with soft baked frozen pretzels. Everyone loved it. This year I asked what the family would like for our PennState Fiesta Bowl party tonight and the results were unanimous: dad’s meatballs and mom’s hot beer cheese dip! I’m doubling the recipe and using Guinness this time. Can’t wait to dunk a warm, fat pretzel in it! Karen, What a fantastic compliment! Thank you for sending that my way. You’ve made my day! I hope you had a wonderful party! Had an “appetizer” Christmas today and made homemade pretzel bites and thought your beer cheese was perfect for the occasion. LOVED the recipe, although I ended up just using the whole bag of cheese instead of just three cups..hehe. Then of course added more of almost all of the other ingredients. It turned out fantastic with many compliments, thank you for the recipe. Merry Christmas! Maliya, So happy you all liked it! And yay to more cheese!!! Can you make this in advance and reheat? Have you left in a mini crockpot to keep warm? Can you use pre shredded cheese (they often mix in potato starch)? Christine, Yes, this can be made ahead and reheated. I reheat it in the microwave 30 seconds at a time stirring each time. Or reheat on low on the stove, stirring often. And yes, I have kept it warm in a small slow cooker. Stir every 30 minutes. I have used pre-shredded cheese for this and it worked just as well as hand-shredded. Well this is delicious, thanks for sharing! Say I think we’ll have leftovers—how well do you think this would reheat and would you microwave it or put it on the stove top again? It keeps well in the fridge for several days. Then it reheats really well in the microwave. Just do it 30 seconds at a time, stirring after each time, until hot. Note: Once it is refrigerated it ends up with a spreadable consistency. You can smear it on toast for a special morning treat, if you happen to have it in your fridge anyhow. This looks amazing, and something my husband would LOVE. This is perfect for an at home date night. Just made this for our party last night. It was absolutely fantastic! I did add a good few dollops of Worstershire Sauce and it was fantastic. I soaked Bratwurst in onions in beer for an hour or so and then grilled them last minute, sliced them and put them on the tray along with the cubes of pumpernickel and soft pretzels. Fantastic, thank you for sharing! Erin, So so happy you liked it. And those brats sound amazing!! I’ve made this twice now with a ton of success for both. The first time I used a blonde ale, which was very tasty. The second time I used a dark Scottish ale, and it was beyond amazing! I definitely think a dark beer pairs best but delicious any way. Thanks for sharing! Karissa, I agree that a dark beer definitely adds more flavor here. Thanks for your recommendations! It’s important to cook the roux before removing it from the heat, otherwise the base has a doughy floury taste. Cook the flor in the bitter until golden brown, then remove from heat. 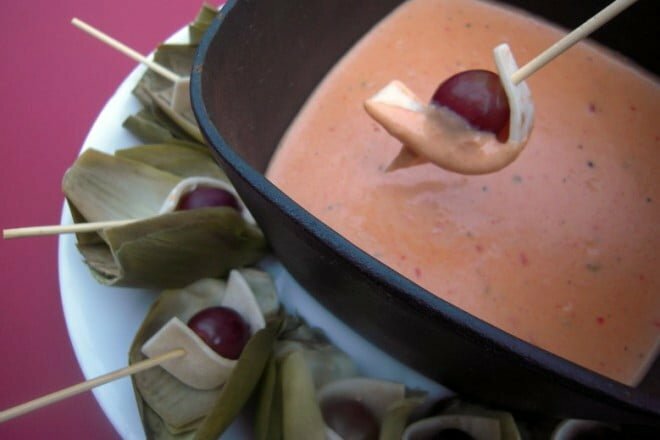 Love this dip and plan on taking it to a Superbowl party with soft pretzels.
! Have you made a double batch of this? Any problems? Micki, A double batch works perfect. Just use a big enough pot. LLIssa, I’ve never tried it on apples but you’re right that it would be amazing! Thanks for a great idea and so happy you like the dip! We’re under a winter storm warning, and I happened to find some awesome huge soft pretzels at our local grocery store bakery today while getting last minute supplies. I threw this together thanks to having most of the stuff already in the house. It is SOOOO yummy and SOOOO easy and exactly what we needed on this very cold night! I cut the recipe in half and it worked out fine. Thank you for this recipe!! Moira, So happy you liked it. You’re totally right, it is perfect for a cold cozy night. I’m jealous! 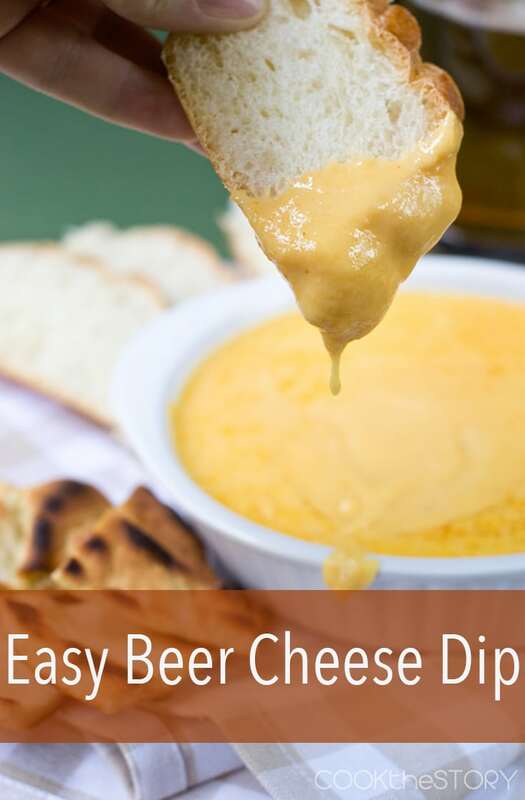 I made this for my husband who is a huge fan of Applebees’ cheese beer dip. He thinks that it is a very close match and absolutely loves it. Thanks so much for sharing! Laura, I wasn’t even attempting for it to be a copycat! Now I need to go to Applebees and taste theirs and see. Thanks for letting me know and I’m so happy you guys liked it. Call it what you will, but I think you’ll find that this is Welsh Rabbit. Check Alton Brown’s W/R recipe. Albert, Welsh Rarebit is a dish where you make a cheese sauce and then pour it onto toast and bake it. This dip could be used that way but it is quite a bit thicker. Looking at Alton’s recipe, for instance, there’s twice as much cheese in here than in his. More flour also. It’s quite a bit thicker in the end. Made this recipe with Guinness, mostly for the colour. We used soft German pretzels for dipping, which I highly recommend! Thanks for the great recipe, I would definitely make it again. Bryan, I have to try that. I’ve never made it with Guinness but bet it would be delicious! I was wondering if this could be stored in the fridge for a little time or if it is meant to be consumed right away? Sidney, It can be stored in an air tight containter in the fridge and then you can reheat it in the microwave, 30 seconds at a time stirring each time until hot. Can this be kept warm for guests on low in a mini crockpot? Katherine, Yes, I’ve done this and it works very well. Use the lowest setting on your slow cooker. Could you substitute cornstarch or a rice or potatoe flour for the wheat flour to make this gluten-free? Melissa, possibly but I haven’t tried it so I don’t know for sure. If you were trying cornstarch, you would make it totally differently. What I’d try (no guarantees) is to mix together 2 Tbsp cornstarch with 1/4 cup milk until smooth. Put it in a sauce pan with the remaining milk and beer. Heat stirring occasionally until bubbling and thickened. 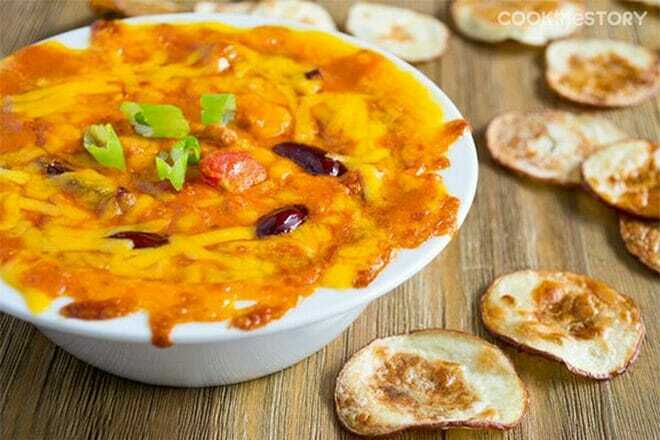 Stir in remaining ingredients and heat and stir until cheese is melted. I think the answer is yes, but I just want to double check, is all the alcohol cooked out of the dip by the time it’s served? Actually, Laura, I’d say no. It doesn’t really simmer for very long after the beer is added. There actually isn’t that much beer in there really and if some of the alcohol is simmered off then that makes it even less potent. If you want to be sure that there is no (or much less) alcohol, you could simmer it longer. Or you could use all milk and no beer at all. If you did that, I think you would miss a touch of the bitterness and tang. You might want to add a teaspoon of plain yellow mustard (in addition to the dijon that is already called for). The other possibility is that you could use a non-alcoholic beer. 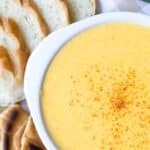 Could you use Velvetta in place of the sharp cheddar? Tina, I’ve never tried it but probably. I think Velveeta might be saltier than regular cheddar (not sure). You might want to wait to add salt until the end. Also, I’m not sure how much Velveeta to use. It might not be exactly equivalent. But you could start with half the amount and taste and see. Thank you for sharing this recipe! I made pretzels to eat with the dip. So yummy! I will definitely be making this again. April, That’s fantastic. I love pretzels and yes, they’d be so perfect for this dip. Yum! Very good. Scroll all the way dawn for ingredient list and directions. I can’t wait to try this out, just curious…what beer do you normally use? I want to make sure the taste is just right! Mariana, I use Boston Lager. But I think any beer that you like drinking that isn’t too dark will do. So delighted that you liked it, Angie! Gina, How fantastic. I’m delighted that you liked it and that you posted about it. How kind. Thank you so so much! This beer cheese dip is AWESOME. I used what I had in fridge which was some 4 state cheddar and a nut brown ale. Seriously, the consistency was spot on and it reheats beautifully. Bought some frozen soft pretzels and it was the hit of the Sunday Football spread. Julie, Thank you so much for letting me know! It’s a true favorite around here too. I often pour it into a crockpot and take it when we’re invited over to someone’s to watch the game. Always a hit! This was really disappointing and I had really looked forward to it. It was the consistency of soup and I couldn’t serve it. Followed instructions. Tips? That’s strange. I make it all of the time. It’s supposed to have the thickness of a cheese fondue. I wonder if you possibly measured the cheese incorrectly. One thing that could have happened: The recipe calls for 12 oz. of cheese. That means 3/4 of a pound. It would end up being about 3 cups of shredded cheese. But some people think that “ounces” means “fluid ounces” sometimes and then measure it in a measuring cup instead of on a scale. 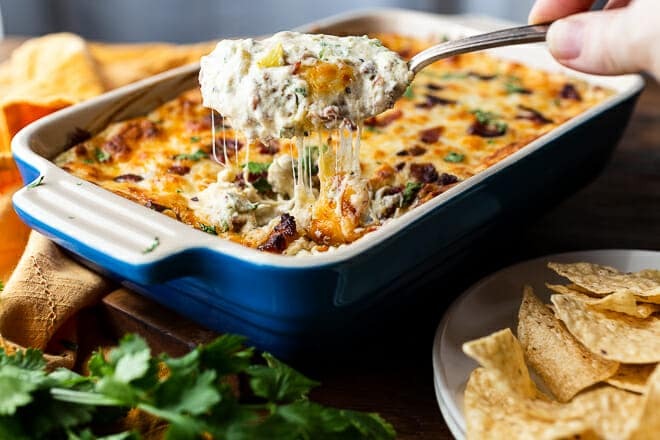 That would work out to 1 and 1/2 cups of shredded cheese, and a much thinner dip. I’m going to change the recipe now to say 3 cups instead of 12 ounces. I know that people sometimes make this mistake and I shouldn’t have set them up to do so. I hope that helps. 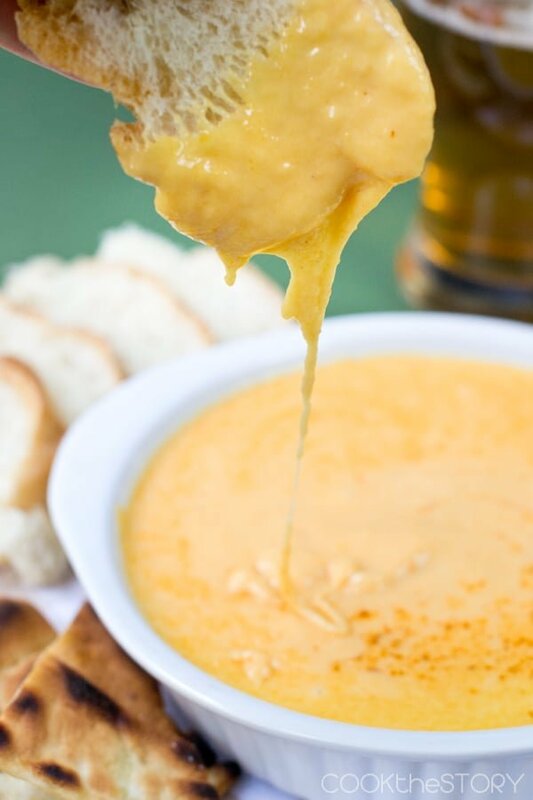 Must you tempt me with this amazing hot beer cheese dip recipe? Ready to dive in! My husband really craves it too!